Previously I mentioned that I will be speaking at the Open Source Conference 2013 in Amsterdam, hosted by Red Hat in the Amsterdam Beurs van Berlage (the old stock exchange building) on the 6th of December. Traditionally this event draws a great crowd, over 1000 attendees the last few years, registration is completely free so sign up now! They have scaled back on my original planned two session, so I will only be talking about what is new in Integration & BPM, but look forward to seeing you there. Join us for a session on the coming product launches of Red Hat JBoss Fuse Service Works (FSW), Red Hat JBoss Business Rules Management System (BRMS), and Red Hat JBoss Business Process Management Suite (BPM Suite). We will walk you through these exciting new technologies, what they are going to mean to you, and how they can be leveraged to expand your business into the future. JBoss FSW is Red Hat’s middleware solution for application integration, messaging, SOA, and service governance requirements. It combines the core ESB technology from our Fuse product and technical innovations from popular open source communities like SwitchYard and Overlord. 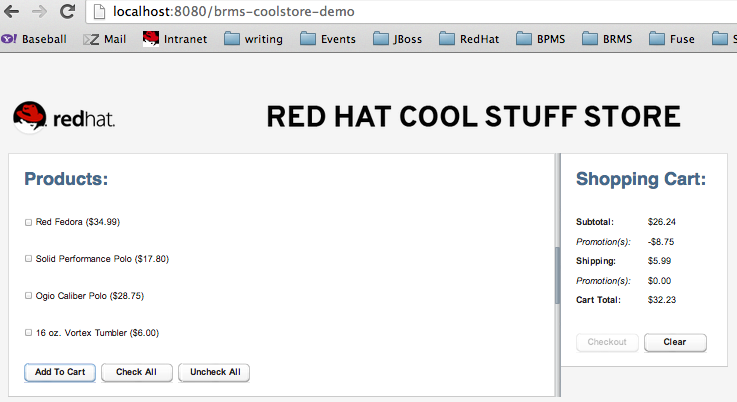 JBoss BRMS and BPM Suite are Red Hat’s next generation products for maximizing your business activities with rules, events, reporting, and processes by leveraging the popular open source communities Drools and jBPM. Getting ready for your migration? This migration article will try to put into perspective the daunting task that any developer faces when asked to evaluate the move from one version of a product to another. We will try to put the aspects that need your attention, allowing you to evaluate your personal project for migration to the new Red Hat JBoss BPM Suite v6. 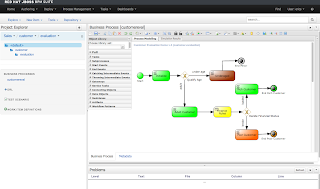 It should be understood that the JBoss BPM Suite 6 product represents a superset of the JBoss BRMS 6 product. 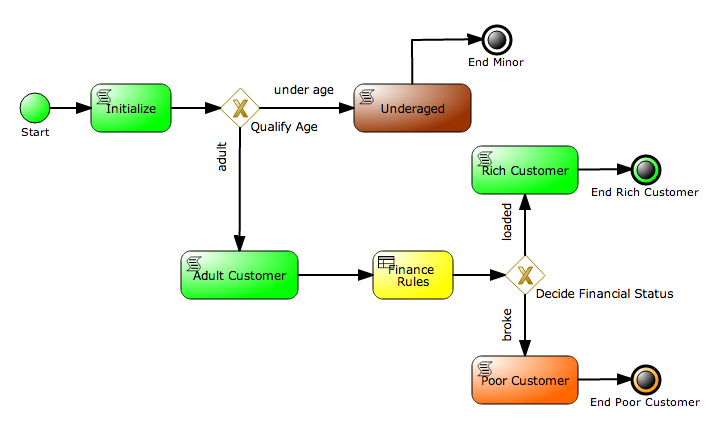 Therefore, by covering the BPM example project we will automatically cover rule project assets as we go along. Please read the projects files for links to other articles describing requirements, products, and how to both install and run these demos in their respective IDE or product UI components. Also note the first demo project is more maturely documented at this time, the newer version will be expanding over time so check back regularly or feel free to submit any changes you feel could be of use. 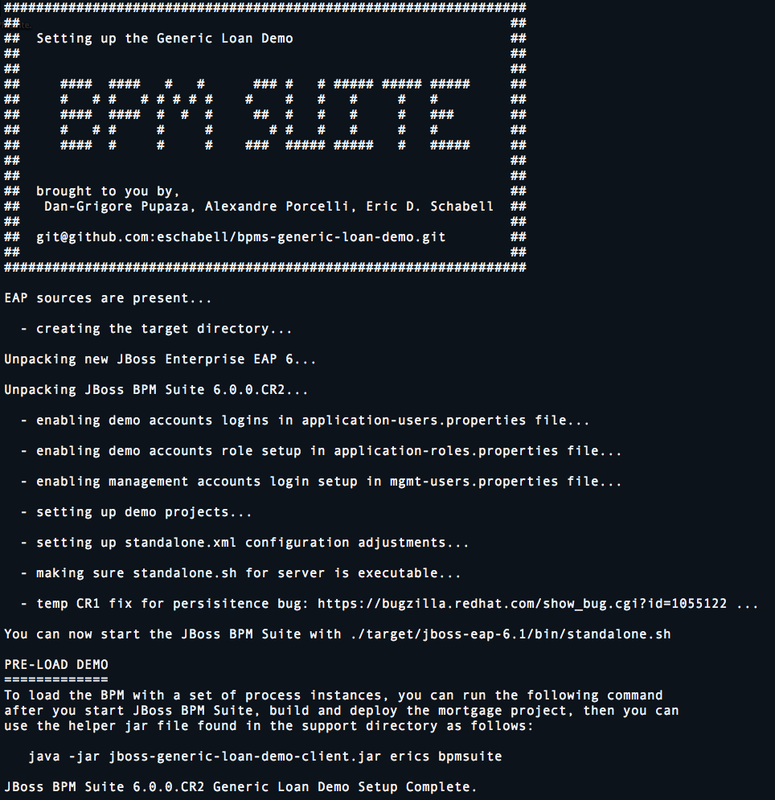 The backbone of the new JBoss BRMS & BPM Suite 6 products is based on using GIT as the repository for all your rule and process assets. Where as the older JBoss BRMS 5 product used a JCR repository based on Jackrabbit, we now seem to have the ability to migrate our projects into the new product with a single push of our project into a new repository. Unfortunately it is not that easy. First you need to understand that the git backend is usable by all tools that support it. For example, the git CLI tooling you can use from your favorite shell work 100% with this repository. What is important to understand is that the current UI provided by the JBoss BRMS & BPM Suite products are not full git implementations. They currently interact in a very simplified way and when unable to interact will often just present an empty repository view. To get the current product working correctly depends on adhering to the needed structure of your git repository. To ensure a project will be available in the products wonderful graphical interfaces, one should create an empty project within the UI with placeholder files for processes, rules, and whatever else you need. It is then a simple matter of running a git clone of this project into your favorite IDE to start migrating your project. Once you have the project cloned, you can add your assets into the project in the correct locations based on the placeholder files. 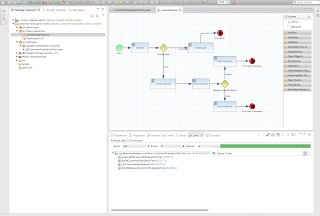 For example, I created an empty customer.bpmn2 file and added my customereval.bpmn2 file right next to it. I proceeded to then remove the old placeholder file and push this all into the repository. The UI of the product automatically picks up the changes and my process asset appeared for use in the designer. Rules files import this same way without incident, other than that you will need to ensure your package name is aligned with your new project structure. The product has a UI that is tailored for a more business oriented user, therefore you can expect the old package naming of the customer evaluation demo, org.jbpm.customer.evaluation, to be more simplified. Ours turned out to be a simple package name of customer.evaluation so we adjusted this in our rules file and all was good. The model for our project consists of two Java classes, or POJO's, a Request and a Person. These needed to be imported into the correct location for the form modeler component to identify, and they would not appear until the package name was corrected as discussed above. There is a fundamental change in how you access your projects assets, so once you have the rules, processes, and your projects model in the product, this will be main available via a maven repository, built as a simple jar file. Below we will cover these details in the section Maven. This means you can split your project into the code project that leverages your rules, events, and processes and the actual artifacts themselves. They will be contained in a project that deploys a jar that you leverage in your application code. Your unit tests will reside in your applications code project and leverage the generated jar dependencies. The core API of the products has been fully refactored. 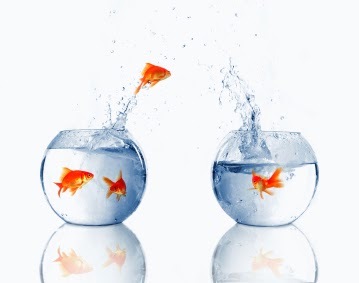 You have to migrate everything you did to interact with the core of rules, events, and processes. For now, you can use the provided backwards compatibility found in the knowledge-api.jar provided just for the projects that want to ride the old waves. Currently it can be found in the deployable-generic.zip, but that could change as the product approaches general availability (GA) status. As for the other half of your enterprises code base, the unit tests that leveraged the jbpm-test.jar will need to be refactored. This jar does not provide for any backwards compatibility and we had to rewrite our existing unit tests. The good news is that the code is simplified, making your unit tests cleaner and easier to understand. For both these jars, you can add them to your maven dependencies once these are made available. We have included and example internal repository where the maven dependencies are found, purely for your information in the migrated customer evaluation project. You can find documentation on this online at the Customer Portal. There is a community tool for migration of existing JCR repositories to the GIT repository format. At this time there was nothing to test but it is being exercised in the productization process. 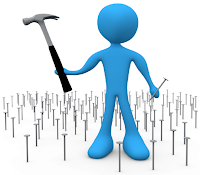 Will this be the hammer that makes all your migrations look like a nail waiting to be hit? Stay tuned for more on this as it has yet to be included in the early Beta releases. Receiving objects: 100% (562/562), 59.21 KiB, done. Resolving deltas: 100% (198/198), done. The JBoss BRMS 5 product provided a task server that was bridged from the core engine by using, most commonly, the messaging system provided by HornetQ. As most customers have created custom interfaces and interacted extensively with the human task component, expect to have some work here to migrate this area of your architecture if using tasks in your processes. Looking specifically at the project customer evaluation, we wanted to migrate a simple application that contains rules, a model, a unit test, and a process. This migration would provide factual evaluation as to the ease with which various aspects of the application could be migrated. Here we would like to present the findings and point you to the project results (ongoing) of the migrated customer evaluation demo. We started with the unit tests and updated the pom.xml file to point to the internal production maven repository and included just the dependencies for the knowledge-api, plus the jbpm-test jar. This code snippet shows just the generic entries for the necessary jars, leaving out the exact version that is set as a property for the current release. You will also note that we leave out the repository entry that will be set to the maven repository you have the product dependencies stored in. Results of migration unit test. Once these dependencies are in your project you can then begin the refactoring needed to change your current unit tests into the ones you will find working in the projects folder. This includes an entry to eventually pull in the jar compilation of the product hosted artifacts, see the comments inline within the pom.xml file. The initial setup used to involve a KnowledgeBase and a StatefulKnowledgeSession. This has been reduced to just setting up a session strategy and RuntimeEngine. # class that you can extend all unit tests off of. Where the older unit tests had to manipulate the sessions, we now have a streamlined case for each unit test. // setup of a Person and Request. // Map to be passed to the startProcess. You will find the completely migrated unit test in the project src/test/java/CustomerEvaluationTest.java and can run this as a JUnit test. The final step would be to import the existing rule, two Java classes that make up our domain model, and the BPMN2 process. 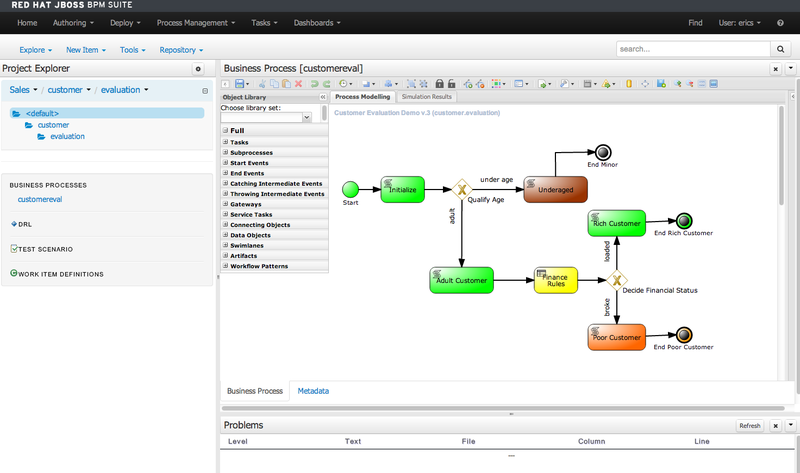 To achieve this we started our JBoss BPM Suite and create a new repository and project. We then created empty placeholder files for the process and rule. Back in our IDE we cloned the project with git clone git://localhost/customer and proceeded to locate the exact files we had inserted. We then removed these and added our existing rule and process files. After pushing them back into the project, they appeared in the UI project explorer. They only needed adjustments to the packaging as that had changed when we created our project, from a long package name to just customer.evaluation. component and then replacing the file with our two java objects. Once the packages were adjusted to match the project definition, they appeared in the UI. Form modeller with imported model. The form modeller creates objects with annotations and our objects currently do not have them. This is causing some issues when we try to run the process (which builds and deploys). The JBoss BPM Suite attempts to generate a user task form to submit the initial process variables, but as they are objects and not the string fields we are provided, this fails. These are the early days of JBoss BRMS & BPM Suite products, so an early look at the migration possibilities is just that, an early look. This is not the definitive guide to migrations, but a summary of the areas that will be affected and what you can expect based on a small sample application. The issues around annotations on our model, dealing with importing a model, packaging paths all seem to be worth investigating further. This should be taken care of once the final documentation is provided for the product. 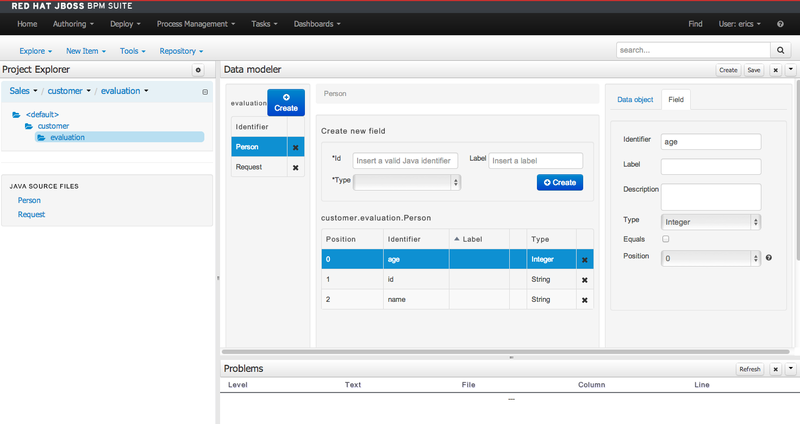 Note that the projects/customer-evaluation-demo is intended to be imported into your JBoss Developer Studio and interact with the running project in the BPM Suite. This is currently a work in progress, so watch for progress updates as the final product launch approaches. We will continue to migrate our other demo projects and follow up with updates of what is encountered along these lines. Each project will be more complicated and involve exercising more and more of the product functionality, integration, and usability. This article is brought to you by an example of our strong links to our partners, people who understand and leverage the Red Hat JBoss middleware products for their customers. 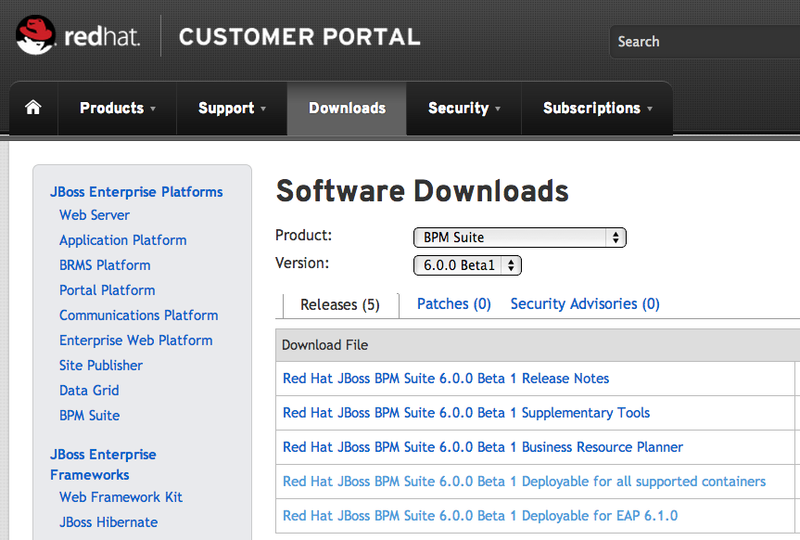 Last week for current Red Hat customers we have made the Red Hat JBoss BPM Suite Beta1 available. This is a milestone release on the way to a final version 6 release. This demo originated from Dan-Grigore Pupaza who works for a Red Hat partner. 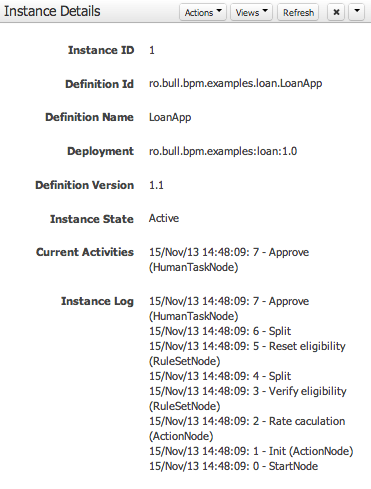 Without going into details that will be presented upon a final Beta release announcement soon, I wanted to give customers with access to the Beta1 release a head start by providing a completely automated setup of the JBoss BPM Suite, with a pre-configured generic loan demo project out of the box. This project is setup like all my previous JBoss demos and therefore should be a snap for you to get started with. You just need to obtain the project, download the products from the Customer Portal, and push the start button. 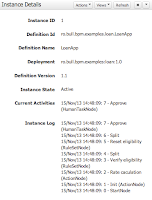 For more details here is a bit of a walk through to get you on your way, starting with the Github hosted project bpms-generic-loan-demo. With this project still based on the Beta releases, the final documentation has not been added, therefore I provide the walk through in this article instead. This will be replaced with details quickstart documentation in the project you cloned above in the future, including a slide overview of the project architecture. Now you can execute in the project root directory the provided init.sh (or init.bat) file. 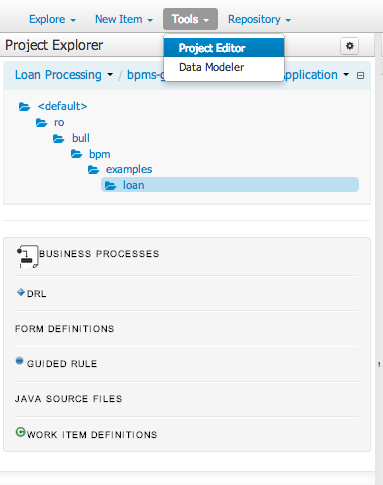 You will now note that you have a new directory, target/ that contains the JBoss EAP server, an installation of JBoss BPM Suite, and a pre-configured generic loan demo project which you can start as follows. 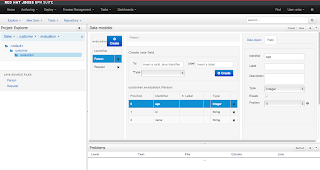 # the JBoss BPM Suite in the directory you start it from. 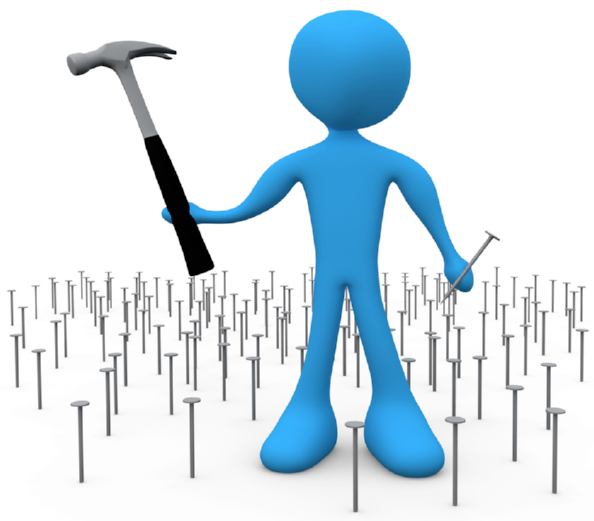 There are a few roles defined and configured for the human task that is part of the generic loan demo. User alan with password bpmsuite, has Loan Officer role. 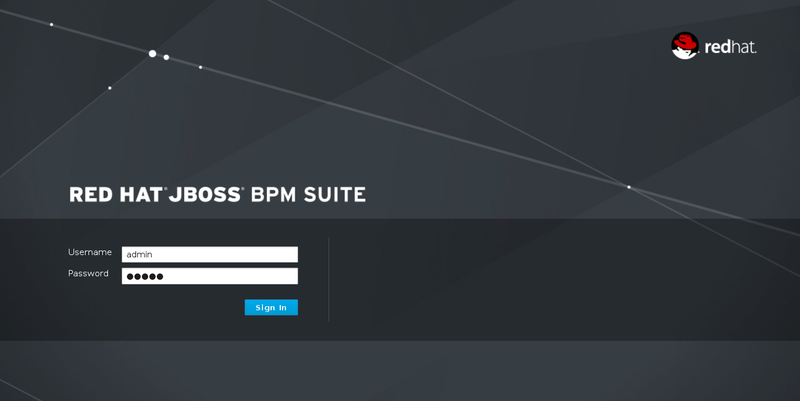 After login you will see the initial screen with links to various parts and components of the JBoss BPM Suite. It has been pre-loaded with the generic loan demo so no need to use the Authoring -> Administration menu where you would start to either create a new repository and project, or import an existing one from some Git repository. We will go straight to the generic loan demo to inspect, build, and deploy our first instance of the process by selecting Project Authoring from the listing on the left of the screen. This will take you to the empty Project Explorer view with the generic loan project pre-selected in the right hand menus. This will then load all the existing project artifacts into the Project Explorer business user browser on the left hand side. Now we want to build and deploy the project, so that we can start our very first instance to run through the demo. To do this we need to open the Tools -> Project Editor which will give you the Project Screen that has a Build & Deploy button at the top right corner. Hitting that button will give a green bar pop-up that says Build successful if all goes well. 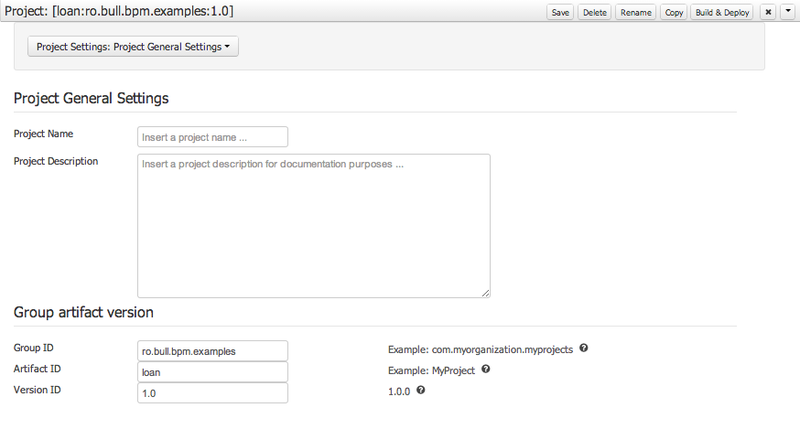 Now you can open the Process Management -> Process Definitions at the top to get to view your deployed project. You will see a single entry for the LoanApp and you can inspect it by clicking on the search spy-glass icon on the right, which provides process details. The button New Instance at the top can be pressed to deploy a new process, which pops-up with your first form to submit a loan application. The following data can be filled in to initiate the process. I will be attending the Open Source Conference 2013 in Amsterdam, hosted by Red Hat in the Amsterdam Beurs van Berlage (the old stock exchange building) on the 6th of December. I will be giving the following two talks. Join us for an action-packed half hour where we take you through the Cloud Guide that covers everything and the kitchen sink! 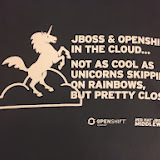 We have all the examples, demos, and practical tips for ratcheting up your knowledge of what is available right now in the world of open source JBoss based xPaaS functionality. Not only will you be able to setup diverse PaaS solutions, you will be shown how to leverage your existing application with the product of your choice - examples with JBoss BPM, Switchyard, Opta Planner, JBoss Mobile, JBoss Portal, and more leveraging the OpenShift PaaS in just minutes. If you want to learn more about the practicality of Red Hat's xPaaS vision and the role JBoss can play, see how investing an hour of your time can change everything you thought you knew about putting your business applications in the cloud, this session is for you! This year spending a few days at Devoxx 2013 in Antwerp with some of the JBoss friends I have, both old and new. This event is amazing for the volume of attendees, 3500, and the quality of the talks is only paralleled by the value of networking with all of your fellow Java contacts. I spent time chatting with Ray Ploski, Mike Piech, Koen Aers, Dan Allan, Dimitris Andradis, Emmanuel Bernard, Xavier Coulon, Tim Fox, Arun Gupta, Gavin King, Jason Porter, Burr Sutter, the local SA team, many customers, and a vast array of partner contacts. I sat in on a few sessions but I had the most fun chatting with customers, partners, and users of the JBoss projects and products. There were also a nice set of mini JBoss sessions given throughout the conference days at the Red Hat booth. My talk was in room 9, a large movie theater with about 300 attendees. The following is a collection of pictures to give you a bit of a feel for the Devoxx experience. There were also various mini sessions held at the Red Hat booth throughout each day. I was scheduled to give a talk on Wednesday, but something came up that prevented me from making my slot. I post the slides here for your enjoyment none the less. See you next year at Devoxx 2014! In the previous article in this series, we talked about extending and expanding your enterprise integration to account for an expanding architectural landscape that included diverse backend systems. In this article we want to provide an example project, called the BRMS Fuse Integration Demo, that demonstrates how to achieve some of the discussed use cases, specifically how to integrate your service bus with a business process engine. The project we provide covers the last use case, where we want to trigger a business process from one of our JBoss Fuse (Camel) routes. Our project provides the following aspects to provide you with a quick way to get started and an architectural blueprint. 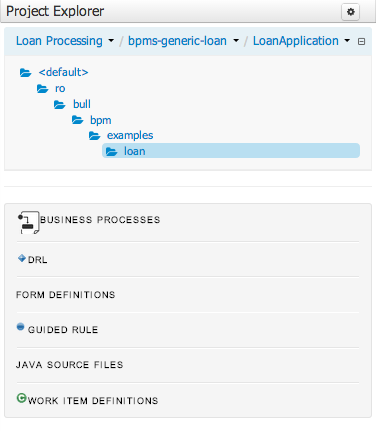 The reference project shows an example of integrating JBoss BRMS with a focus on the BPM component and JBoss Fuse. The environment consists of a JBoss Fuse instance with a Fuse (Camel) deployment and a JBoss BRMS instance with a BPM project. We touched on the business process, but let us examine the rest of the projects in more detail. We have designed our architecture to loosely couple the business process allowing access by other components, like our JBoss Fuse example project, by using a REST client from our Camel route. The REST client uses the Process ID and the proper user credentials to start a new instance of the business process. The src/data directory defined in the Camel route is checked for xml messages which contain a stock code in a SOAP message. In our example we are using RHT as the symbol to get stock data on from the external SOAP Web Service. Open up the message1.xml file to see the sample SOAP envelope and body. When a xml file is found then the body of the message is read in and displayed in the log message. Next the message is sent to the external SOAP web service to get the stock information. The response that is returned is then displayed in the log message. Next the startProcessFromCamel method in the RestClientSimple is called to start the business process that prints hello world. 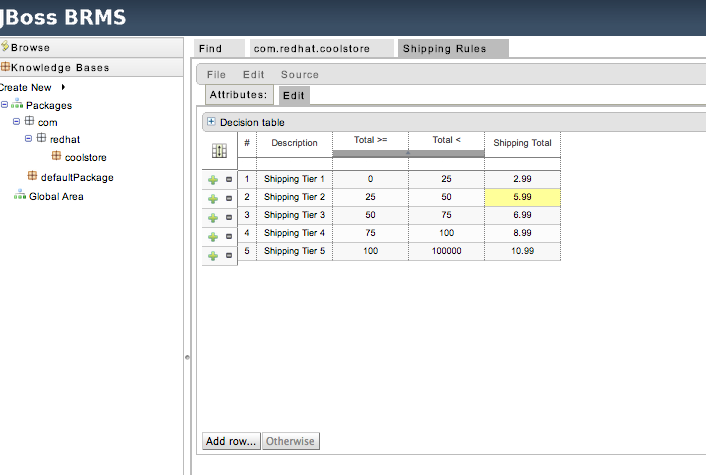 Additional information on calling the RestAPI that is provided by JBoss BRMS BPM component is found below. As noted in the section Future work, the stock data will be sent to to the business process. The process id is displayed in the log message. The Fuse project starts with our simpleRoute project, which contains two parts. 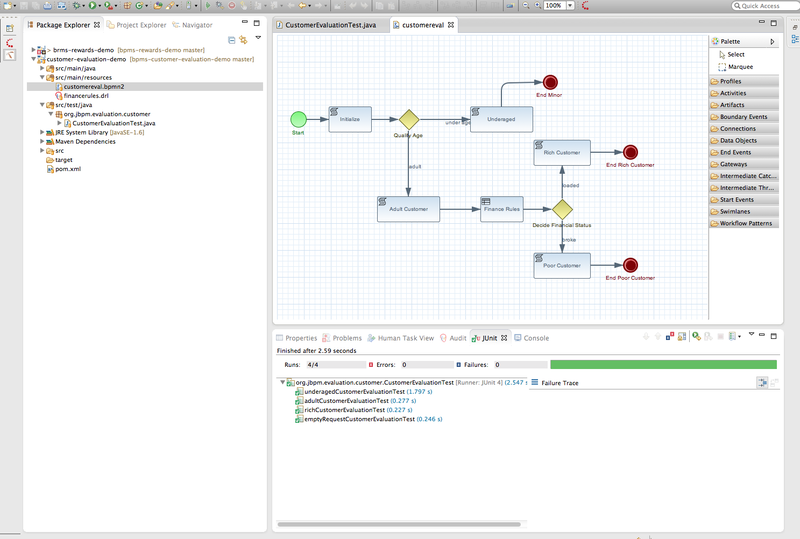 The first is our RestClientSimple class, which allows us to define the business process ID and the user credentials. We need this class in when dealing with starting our process through the JBoss BRMS BPM RestAPI. The second is our camel-spring.xml file which contains our bean and route. A bean is defined with startit as the ID and RestClientSimple as the class. Here is a closer look at a section of the camel-spring-xml file. Note that the SOAP web service call to get stock data and then the call for the startProcessFromCamel method in the RestClientSimple class. We aren't currently passing the stock data to the business process, but that is possible, see the section on future work. 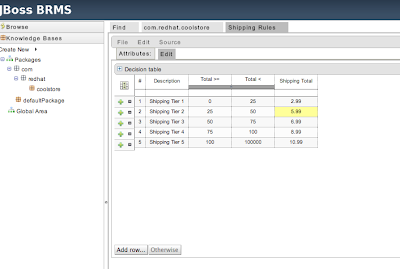 Our RestSimpleClient gives three options for interaction with our JBoss BRMS BPM deployment. In our case we are will be using the first option, but for more information on the RestAPI see the Red Hat Customer Portal Knowledge base article. This article has demonstrated how to integrate your service bus with a business process engine. This example project solved only one of the use cases and there are interesting extensions that could be added. The business process can be replaced by a more extensive example process, such as the Customer Evaluation Demo to show both BPM and rule integration. Parametrize the REST service such that diverse processes could be called. Pass the Stock data that was looked up in the Camel route as a parameter into the business process for display like the current Hello World. These extensions we leave for you to work out, like homework exercises, as you explore the integration scenarios that JBoss BRMS and JBoss Fuse can solve for you.